Marjorie’s passion and love for cooking is evident throughout each of her four acclaimed cookery books. There are over 600 recipes to entice you, all of which are easy to follow and simply delicious. This is the perfect gift for any friends or family occasion. You can purchase a signed copy of Marjorie’s Kitchen ‘My Recipes for You’ and for a limited time only we are offering FREE postage to anywhere in Ireland and a 50% discount on postage to anywhere outside of Ireland. 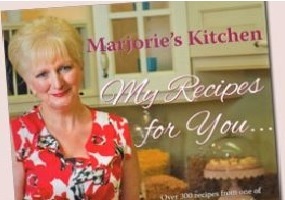 Click here to order your signed copy of Marjorie’s Kitchen ‘My Recipes for You’.